I like trees. I like them a whole lot. This is a simple spell. It is similar to a container spell you would see with apples and love in Hoodoo. This is a prosperity spell. Pine is usually used in magical operations for prosperity, fertility and makes for an excellent spiritual cleanser/healing. I know many people will carry about pine needles for that in a mojo bag. Used as an incense, it can be used to clear out and reverse negative energies ( See Hands on Chaos Magic for primers on how to generally work with embuing herbs with energy). Usually I would tell people to start the pine tree with from seed if at all possible. Take your time, don't let anyone push you into going faster then you want. Breathe Deeply, continuously, and for a few moments. Run your hand over the trees, or in them. Keep breathing deeply. Notice subtle differences in how things feel. What is different between the trees.. Don't over analyze. Keep breathing deeply, just paying attention to how the trees feel. Usually. one or two will stand out as more right to you. Those are the ones to take home. Remember, you WILL be in a relationship with the tree. It will be with you, near your home. If you need more help, Hands On Chaos Magic, has more exercises to detail energy sensitivity and energy dosing exercises like the above. Knee before the hole. Grab some of your money, coins and paper dollars and pray. Spend 30 minutes praying in your own way that as the tree grows so does your money. Trees get big, although they steadily grow. Place the money in the hole. As an optional, and practical helper, I will put mycolonization fungi in with the paper money. I learned about this from http://www.fungi.com/shop/the-life-box.html so the money will have a lateral increase in foundation. This prepares the soil or foundation to be good. Plant the Tree over the money and the fungi. Spend a few minutes meditating with the tree. Give the tree some of your energy. Thank the tree for coming to stay with you and ask the tree to heal your money problems. Really, just relax and chat with the tree. Pray again over the tree. Watch your money grow as you take care of the tree. Since I had visited the forest over the weekend, I sat and prayed to Gran Bwa, of course, after asking Legba to open the door ( and doing so in a New Orleans Style of Vodou). I then asked Gran Bwa to lend some of the Ashe of the forest to help the tree ( and my new prosperity get started). I gave the tree some of the Stream Water I had collected form the forest. My significant other Becky came home and said the tree was absolutely glowing. The next day, a Spider had made a web on one side. I took this as an unbelievably good omen as I have weird relationship with spiders anyway, they always bring me good luck when they are around. this is awesome. is it hoodoo? is it vodou? is it magick? or is it "Andrieh's Best?" You are really on to something! I see this kind of spell as having a broader appeal than just the Magi types, especially if you involve the family and their energy and love to make it work. See? Write more of these and next time include some before and after images! This is a derived Hoodoo spell. Usually in Hoodoo, There is a spell to grow love that basically involves planting a plant over a apple that you have prepared. However, its clear in Hoodoo, you can develop new spells based on the principles and what you know. So to answer the question, I would say all of the above. It is Magic, it is pretty consistant with Hoodoo. 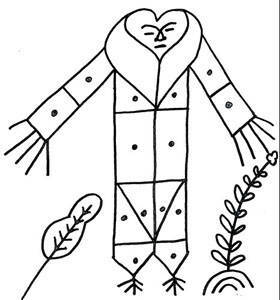 Whether or not this is Vodou depends alot on what you call Vodou, although as I told the kids, I plan to plant one or more trees with these types of spells attached per year. Next trees will be Apple, and they will be related to health and Vitality for me and the family. Part of this is derived from that, part of that is derived from Divination/Intuition and part of it comes from working with Leave magic in the way I do...although the principle is the same... as the plant grows so does X. Since Plants have spirit they are quite capable of lending Ashe to an intention in this way and this is a long term relationship, where I will weed and take care of the tree the best I can. Because of the doctrine of signatures and various myths, Pine is associated with prosperity ( Money = Green, and the pine is ever green), so its a good plant to use for this. 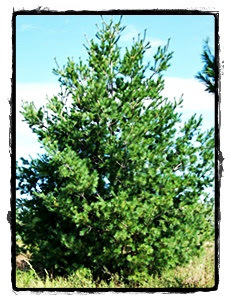 In addition, Pine is a great spiritual cleanser meaning, I anticipate the negativity around money also being grounded. The insight is instead of using the needles in an incense, I am asking the spirit of the Tree for help and keeping it alive. Which has lot of benefits. Absolutely love any ritual work with trees! But that would be the tree-hugging Druid in me. I've been looking for ways to incorporate local trees into my practice of sacred trees. This is perfect! Thanks! Also good to note that for those who don't have access to their own land, there are many tree planting programs around in local parks.